A 44-year-old banker was shot in a station car park in what police believe was a targeted attack. The man received a gunshot injury to the leg after the assailant wearing a balaclava shot him before fleeing the scene. 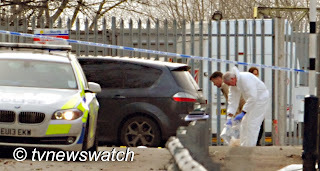 The victim, who has been named as Robin Clark, a broker with City firm RP Martin, got out of his car in Mount Avenue car park behind Shenfield station, Essex, and was approached by a balaclava-wearing man at around 05:51 GMT. He was taken to Basildon hospital to receive treatment, though police said his condition was not life-threatening. Meanwhile police carried out a detailed examination of the scene before removing Mr Clark's vehicle, a Ford S-Max, on a lorry. Speaking about the incident Detective Superintendent Gary Richardson said, "At this stage we believe the victim of this assault was deliberately targeted." "We do not believe this incident was gang-related and I would like to reassure the public that there is no reason for any undue concern," he added. Trains running through the station were disrupted and a number of services were cancelled while investigations were conducted by police. However services resumed at about 07:00 GMT. Many commuters also faced problems parking as the main railway station car park remained closed for much of the day.